I miss my Mom, especially on days like Mother's Day. It's days like this (one of many) that always makes me wonder why I agreed to moving. I'm so glad I have my girls with me, they truly make the days worthwhile. 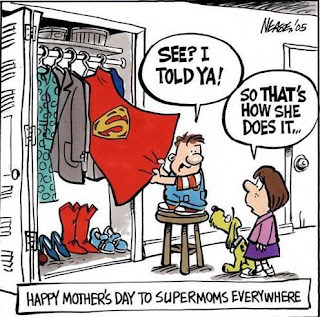 Happy Mother's Day, Super mom! Have I got one of those in MY closet? I'd love to make one for your daughter if you're interested. Cost is $15 + $6 S/H to Canada (I'd ship it as First-Class Mail® International Package). If you are interested, email me at ales@sparkleandcharm.com and I'll send you a customized PayPal invoice. * Name of your daughter. * Her 2 favorite colors (I can make the crown in colors different than pink/purple if you'd like). I think your daughter will love a crown of her own!